Your home reflects your persona, and it must shine just like you. From outer walls to inner walls, from the ceiling to doors everything must look perfect. The walls speak a lot about who lives in the house. If it is an office, the setup of the office is crucial for productive employees. The way a building is painted is very important for the people dwelling in that building. That’s exactly for what our professional painters are trained. We offer all kinds of painting services in Bahrain. Our painters will paint your walls, ceilings, doors, grills, etc. with equal ease. They are comfortable with all kinds of paintings, from emulsions to oil paints. You’ll be very happy to see the finesse with which our painters decorate your walls. Our painting services in Bahrain are the best. Our painters are skilled and fast working. They’ll give your walls a touch of our professional hands, and we promise you won’t be disappointed. We can even help you choose the best colour for your interior as well as exterior. Our expert painters are well-trained and experienced to cater to all your custom painting needs. We constantly update our knowledge with latest trends in painting decors and impart the same to our painters. You will never be disappointed with our painting services. Our job begins with your call or online appointment booking. Once an appointment is scheduled, our painting team will pay a visit to your place. The team will take a detailed look at the work and inspect it thoroughly. In case if it finds something that needs just a minor touch up and can be done within a couple of hours, we’ll do it then and there and an invoice of the work can be generated. In case the inspection results in a tentative work of a longer time, we will take an estimate of the total time, the cost involved, the kind of materials required, etc. The estimate will be detailed which will be the expected cost of the total work. Once you get the estimate, you may then decide whether or not get the work done from us. In case you decide in our favour, we’ll waive off the nominal visiting fee that we charge from the final invoice. Only after the work is done up to your satisfaction, we’ll provide a detailed invoice stating all the costs incurred, labour charges, taxes, etc. and accordingly payment is collected. Why is Our Painting Service the Best in Bahrain? We are a professional company that thoroughly believes in staying on the top through constant improvement in our skills and experience. We keep sharing our experiences and constantly train ourselves to stay updated on the latest trends, technologies and customer demands. 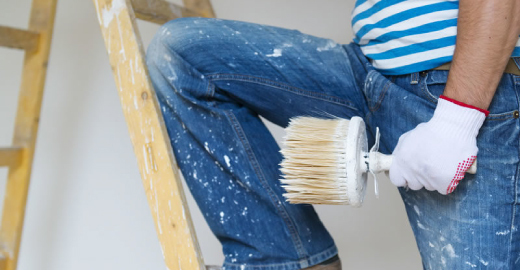 We always keep our workmen equipped with the latest and high-quality paints and painting tools. We keep training them on newer, better and more efficient painting techniques to keep them at the best of their performance and rise above the competition. We keep moving forward; that is what makes our painting services the best. Painting is a job easy to start, difficult to master. A professional painter can paint a wall in a matter of hours what might take days for someone not habitual to work. Also, using the materials efficiently is something a professional painter would excel at. Also hiring an experienced painter to do a job might end up saving you some money. Moreover, an experienced man would be able to do the job so nicely, you’ll never regret having given them the opportunity to work. The quality of work speaks for itself and needs no explanation. Handyman painting services include coloring of all things such as walls, ceilings, doors, windows, grills, frames etc. by using appropriate paints and coats. We offer fast, reliable and durable painting solutions at the best prices all over Bahrain. Handyman can be reached by calling on all days. We take bookings and appointments every day. You may book an appointment with our painters between 8AM-8PM on all days. You may call us to pay you a visit in advance or on an emergency. Choosing handyman is equivalent to choosing quality. We have the best workmen in Bahrain with proper experience and relevant certifications and license. Our workmen are thoroughly professional with a knack for their job. You’ll never be disappointed with our service. Our commitment towards our work makes our painting services the best in Bahrain. We have always been artistic people. Our history is filled with art and literature, and our culture reflects it everywhere. Our lives are a reflection of our artistic nature. We always want our homes to look elegant. Long before modern painting techniques were invented, we were decorating our walls and homes with colours. We are a colourful country and our houses reflect the same. Painting is an important aspect of keeping our homes looking elegant, beautiful and filled with Bahraini cultural essence. We may not use older painting techniques anymore but we can still make up using modern painting technology. Painting your house not only gives it beautiful look, but also protects it from dust, winds, harsh weather, etc. Using the right kind of paint will also ensure your house remains free of any wear and tear, corrosion and internal damage. Our painters are well trained, experienced and licensed for all kinds of painting jobs. We can paint doors, door frames, window frames, metal furniture, walls, etc, with equal skill and with great efficiency. Our painters are all well versed with their job and are so finely tuned to do it; you’ll have a hard time finding any faults. Which Paints Does Handyman Use? Our painters can use any kind of paint from oil-based wall paints to distemper, from primer coats to emulsion, from plain walls to textured wall paints; we can handle anything that has to do with painting. The type of paint will depend upon many factors such as cost, durability, requirement of the wall etc. We usually use different paints to paint outside walls and inside walls. Our painter will suggest proper paints and advise you accordingly. We can paint on the ground floor or even on the 50th floor without a problem. We Paint Fresh as well as Repaint? We are experts at applying fresh paint to newly constructed building walls or repaint the existing walls of an already existing building. Our painters use only the best materials for wall putties, coatings, primer paints and final coats. For repainting, our painters can put the same colour back or remove old and apply new paint altogether, depending on your needs and wishes. Check with our painting team for details.